Dawkish (Sauromatia's player) is very busy with his work. He's not able to take his turns or make any posts. Xanrick volunteered to be his substitute, but unfortunately after a few turns he had to bow out as well. I have taken up the mantle for Sauromatia, but you guys will have to wait and see whether that actually means that the cannibals are alive and well at the current stage of the game. 1. I didn't play the turns I'm posting, so I cannot offer much insight into what Dawkish or Xanrick were thinking. 2. I don't have quite enough free time to completely pick apart and analyze a dozen turns all at once, though here at the beginning I will do my best so that we can all get caught up. 3. Most of Sauromatia's activities will probably be covered by nearby nations, primarily buildscharacter and TheDemon but also Irony.or.Death and even Lilli. Turn 1 - Dawkish's original post about turn 2 was correct. Nothing much happened. Even so, I slapped something together so you could see a few of the units he is using. One thing I find interesting is that even though Sauromatia has access to generic scouts, they do not start with any. Instead of a scout, they get one of these guys. 90% of Soothsayers have 1 rank of Astral magic while the rest have none, which means that these guys can be recruited without a lab, but most of the time they will have a magic path and can therefore build one. Also they have a 5% chance of preventing bad events. That chance is additive, so 20 Soothsayers in one province would make it immune to bad events and also be a hilariously terrible allocation of resources. At least they only cost 60 gold for 3 research (this one has 4 because Dawkish took Order 3 Luck 3 Magic 1 scales, and the Magic 1 part adds 1 research point to each mage. Anyway, Dawkish recruited about a dozen adrophag archers, which are cap-only archers who shoot poisoned arrows. Sauromatia has loads of different strategies available, but almost all of them involve these guys (well, these guys and Witch Kings but we haven't gotten to Witch Kings yet). He also recruited an Enarie, which is a fortune teller who is a much more powerful mage than the Soothsayer. At 150 gold and available anywhere with a fort and a lab, these guys are pretty solid. Technically the Soothsayers make for more efficient researchers, but you can't do much with them besides drop a few early buffs or turn them into communion slaves. Granted, those things are not bad (especially given that astral communions and blood communions are compatible). 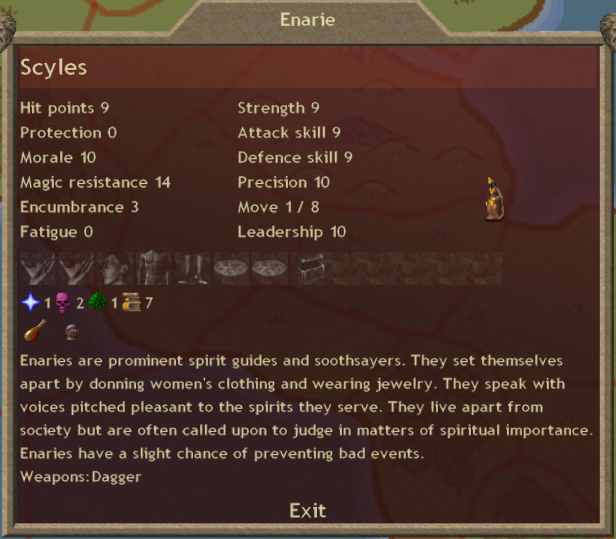 The Enaries can at least sling a spell or two when your research is high enough, and in absolute turns they have 6 research per mage (7 within Magic 1 dominion) so you can reach your research goals more quickly with them if you're willing to pay a bit more. Turn 2 - The expansion army set out and Dawkish recruited another dozen androphag archers along with his first Witch King. These bad boys can only be recruited in the capitol, but they are tremendous. Their random paths are 100% for Water, Death, Nature, or Blood and then another 10% for the same set. They also have the Fear and Standard abilities, and they are sacred. Basically if you are playing Sauromatia and you can afford to recruit one of these guys then you should do that. Oh, also he got a random event which resulted in a magic item (he mentioned that in his post). It's not terrible, but as a crossbow it's only going to be fired a couple of times and any single shot of a ranged weapon is not tremendously accurate. But what the hell, it's free! It curses the wielder but Dawkish put it on the expendable starting commander, and who cares if that jerk loses an arm? Nobody. Turn 3 - The first battle against independent forces was a victory, though Sauromatia lost 3 of the 10 light cavalry it starts with as blockers. Sauromatia starts with 10 light cavalry and 15 archers (not androphag archers, though), which is not bad as starting armies go. Both the prophet and the commander were on the Hall of Fame at this point. The commander ended up with an attack skill bonus and the prophet got the magic resistance bonus, which are at least reasonably appropriate bonuses for their jobs. 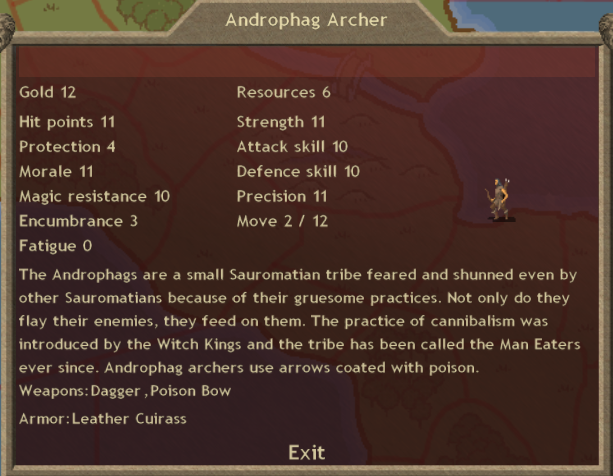 Dawkish recruited another dozen androphag archers and moved his expansion army toward a Wolf Tribe province. He also recruited a generic commander from his new province. Turn 4 - The expansion army lost 2 more light cavalry blockers, and the rest retreated back to the first expansion province. The freshly recruited generic commander gathered up those five cavalry and returned them to the capitol. Meanwhile the expansion army continued on--sans cavalry support--to another independent province defended by infantry and archers. And of course he recruited another Witch King and another dozen androphag archers along with a few Amazons with spears and shields. Unless I mention otherwise, assume that every turn Dawkish recruited a Witch King and a dozen androphag archers in his capitol. Turn 5 - The expansion army took one casualty and ended up in Hinnom's cap circle. They then turned back--and south--toward a lizard province. Back at the capitol, the cavalry and the amazons joined up with about three dozen androphag archers. 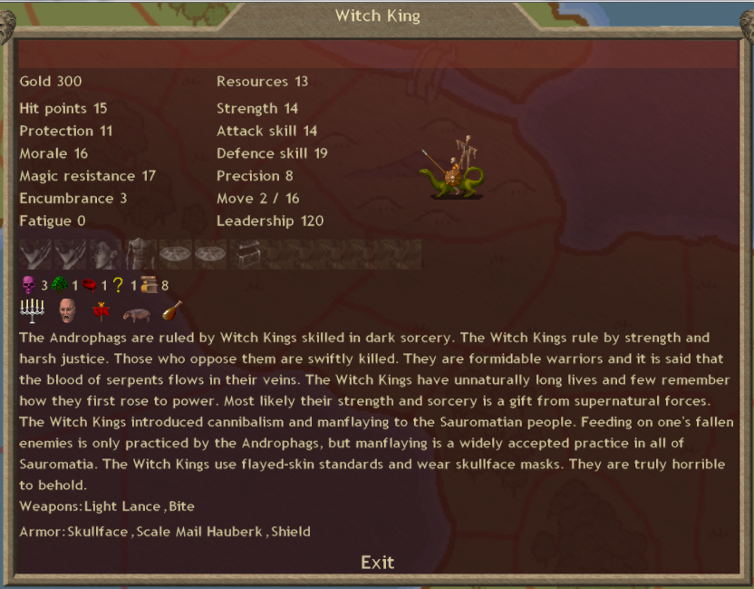 A Witch King led that group to attack another independent province adjacent to the capitol. Dawkish completed the first level of Enchantment research and continued on with that school. Enchantment is the school you need to raise tons of skeletons in battle, which is a useful thing to do, and something that Witch Kings are good at doing. Turn 6 - The Witch King's army faced a group of defenders that include a Wind Master (A2 mage) and two Cloud Mages (A1 mages). Most of the amazon and cavalry blockers were killed or fled but otherwise the province was taken without incident. Sadly, those air mages are never available for recruitment in a province (and I don't think those particular mages are even available in sites, though I could be wrong about that). 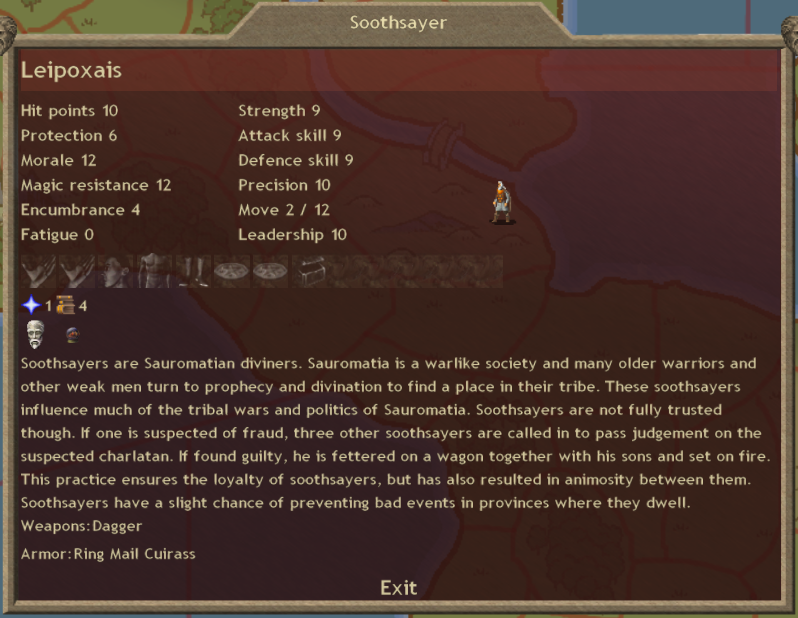 However this was the first province that Sauromatia conquered from which scouts could be recruited, and from this turn onward he remembered to do that most (or all) of the turns that he was able. The prophet's army conquered its lizard province target without casualties and then returned to the capitol. It could have continued west through a barbarian province, but I suspect that Dawkish didn't want to expand too far from his capitol without securing the area nearby. Or maybe buildscharacter warned him about Lanka to the north. Actually Dawkish got an in-game message a few turns later that seemed to indicate the two of them agreed that the barbarian province would go to buildscharacter. In any case he left that province in Hinnom's capitol circle undefended so that buildscharacter could take it. How polite! I've got another batch of turns to post--maybe in the next few hours--that will bring Sauromatia up to about the same speed as everybody else. Edit: VVV Sure thing! I can even retroactively avoid it for this one!